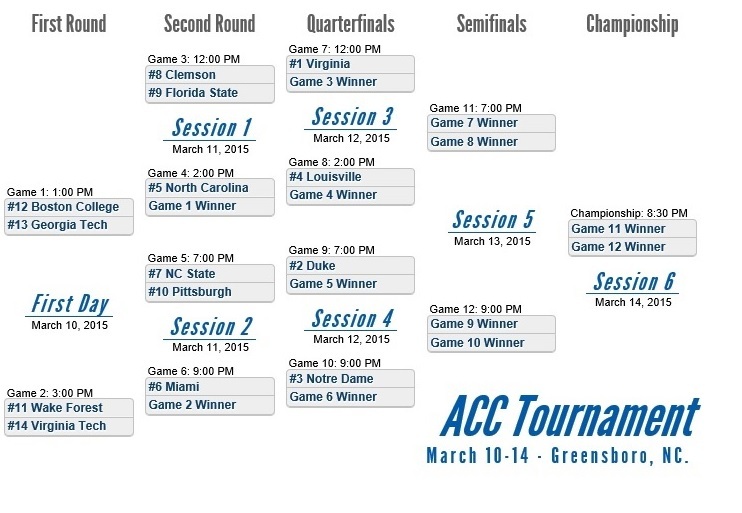 The 2015 ACC Tournament Bracket is now set and scheduled to kick off on March 10th, 2015. We have published a free, printable 20155 ACC Basketball Tournament bracket for you to use to follow the games this postseason. The ACC has some of the best teams in college basketball participating in the postseason tournament to include the Virginia Cavaliers, Duke Blue Devils, Notre Dame Fighting Irish, Louisville Cardinals, and North Carolina Tar Heels. All of the teams except for Syracuse will be participating in the tournament, with the champion earning the conference’s automatic bid to the 2015 NCAA Men’s Basketball Tournament. The final 2015 ACC Men’s Basketball tournament bracket is now set. We have published a printable ACC Tournament bracket for you to use to follow the game action. For those looking forward to the NCAA Tourney, we also have a blank NCAA Tournament bracket for you to use for your own bracketology.